Our son is going to live in a closet. Ok, maybe not exactly a closet, but a study. 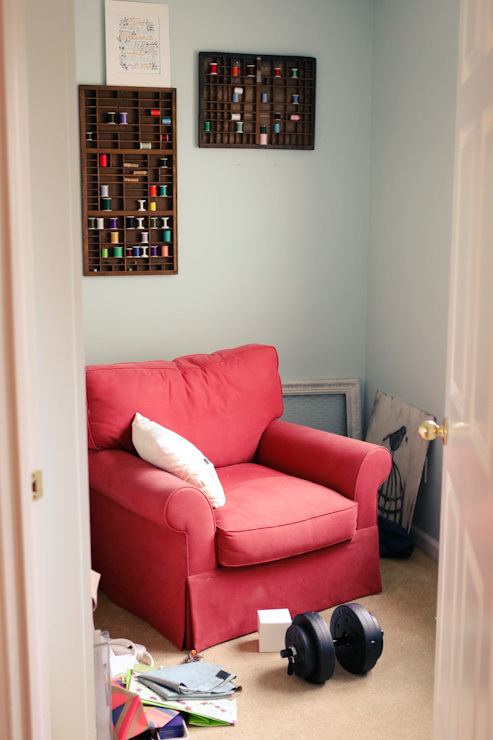 A tiny little study (our former craft room). It's going to be perfect, though. It has tons of adjustable shelving on the left, two pretty windows, and is located right next to our room on the very furthest side of the house with doors that close for him to sleep. Do I even have to mention that I didn't touch a thing before I took this photo (ha!)? It's a catch-all room that we have literally done nothing to. But hey, it's already blue! We've got that part done at least. 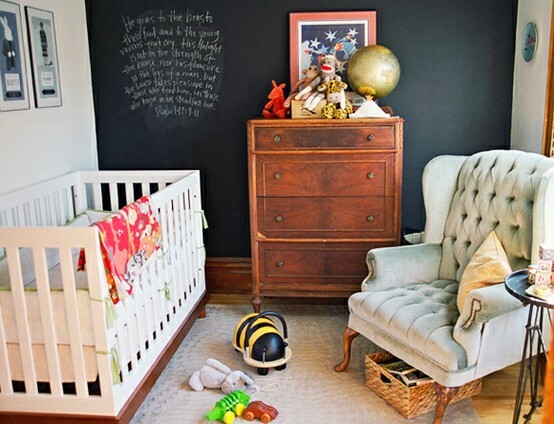 Love this chalkboard wall. Not sure it's feasible in such a tiny room, but definitely want a big chalkboard somewhere. Like the neutral look here, with subtle boy things. Love this empty frame with photos strung across it. 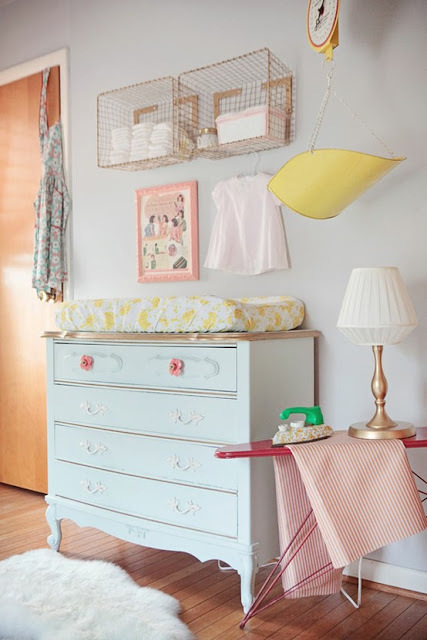 I know this is a baby girl's nursery, but I really love the wire baskets for diaper storage. 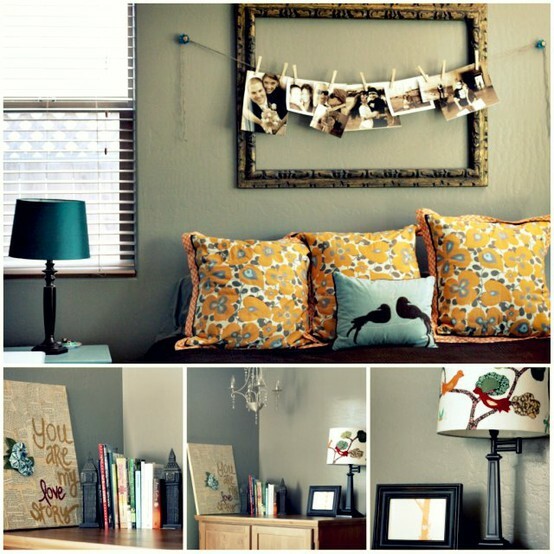 In addition to these ideas, I think I want to go for a very subtle travel theme for his room. 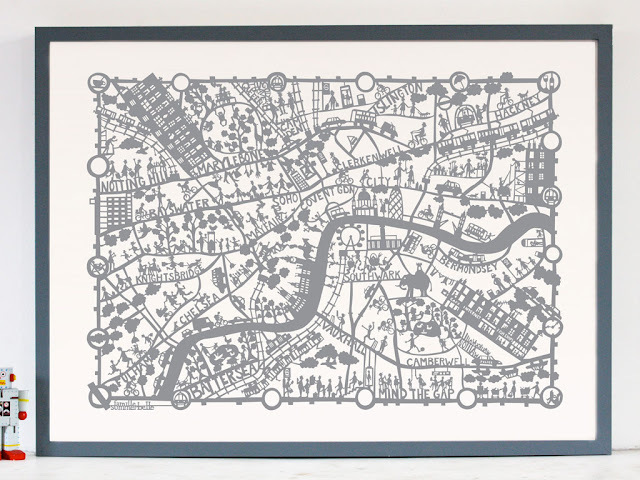 Not necessarily planes and trains, but possibly old maps, globes, and photography prints of cities. We want him to dream big and this is just a little piece of our hope for him. Now I can't wait to get started! Those are such great ideas for inspiration! And I can't help but think of Harry Potter when you said, "Our son is going to live in a closet." Haha. I'm sure his room be wonderful and full of love no matter the size! I love where you are headed with the nursery and just for a little encouragement, the chalkboard wall nursery is my really good friend Anne's and that room is 8x8 on a good day:) Can't wait to see how it turns out! Our son is quite literally going to live in a closet! His "room" will be in the walk-in closet off our tiny apartment bedroom. The crib will stand right next to his very own window, with just enough room to walk around. We sure plan for him to have his own room someday, but for now, that tiny space works! 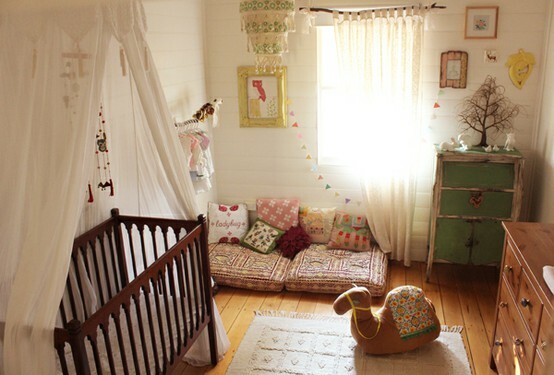 I love the neutral room you posted with those subtle wide stripes and hints of little boy here and there. We can't paint in our apartment, but the walk-in closet is already white, with a tan stone tile floor. It's a good start toward a theme like that! So fun to read about you planning and dreaming for your boy at the same time I'm hoping and dreaming and praying for mine! It's going to be fabulous. Can't wait to see it in person one day, with his cute little self in there! Cool! A word of warning with chalkboard walls - they are SUPER dusty! My brother had one and he gets really bad asthma so it didn't mix very well. A little one in a pretty frame would be just as cool though :) Love your style! A dear friend's baby actually lives in the closet! There's just enough room for a crib, and when he's done napping he knocks on the doors. :) it's really cute. Mom (and Dad) at 26 weeks. Baby boy things I love, Etsy edition. DIY: Pleated linen pillow tutorial.